OAKLAND, California — The NBA’s wild offseason has included DeMarcus Cousins going to the Golden State Warriors, Kawhi Leonard forcing his way off the San Antonio Spurs, DeMar DeRozan being traded by his beloved Toronto Raptors and Carmelo Anthony soon becoming a free agent. No summer news was hotter, however, than LeBron James’ decision to depart the four-time reigning Eastern Conference champion Cleveland Cavaliers to join the rebuilding Los Angeles Lakers. James went from being an NBA Finals rival to a Pacific Division rival whom the reigning NBA champion Warriors will play at least four times next season. Warriors forward Kevin Durant told The Undefeated that he “loved” his fellow superstar’s decision to start over in Los Angeles. The Warriors defeated James and the Cavaliers in three of the last four Finals. Now James is joining a Lakers team that includes fellow newcomers Rajon Rondo, ex-Warriors center JaVale McGee, Lance Stephenson and Michael Beasley along with returners Kyle Kuzma, Brandon Ingram, Lonzo Ball and Kentavious Caldwell-Pope. The Lakers have not been to the playoffs since 2013. Durant recently visited with James in Los Angeles, where the discussion seemed to be more about life than basketball. “Just life. Excited about what lies ahead for him, for us as men more so than basketball players. Just breaking bread and showing love,” Durant said. It will certainly be a major challenge for James and the Lakers to win an NBA title — or the Pacific Division, for that matter — because of the rich-getting-richer Warriors. The Warriors added a fifth All-Star to their team with the surprise free-agent signing of Cousins. Durant is not surprised at the hate coming the Warriors’ way for landing Cousins. “It was expected. Nobody likes a great thing. Greatness is rare, it’s different, and people don’t like different, so I get it. But I think for DeMarcus I liked his approach, our approach to it, coming in, wanting it just to be about basketball, once you look at it that way, it works out perfectly,” Durant said. 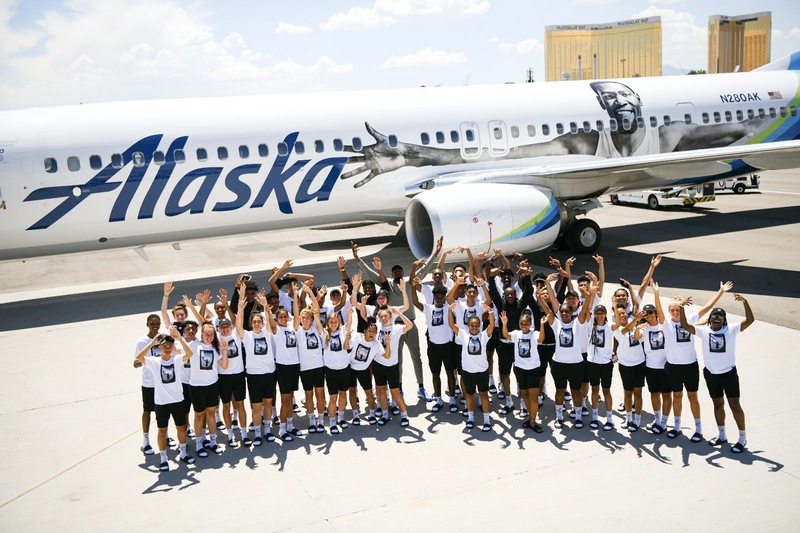 Kevin Durant arrived in Las Vegas on July 25 for USA Basketball’s minicamp in an Alaska Airlines plane with two AAU boys’ and two AAU girls’ basketball teams from the San Francisco Bay Area and Los Angeles. A Durant decal with his arms outstretched was on the side of the Boeing 737-900ER jet. The Warriors earned the most surprising headline of free agency when Cousins decided to accept a one-year, $5.3 million midlevel contract. The 6-foot-10, 265-pounder averaged 25.2 points, 12.9 rebounds and 5.4 assists for the New Orleans Pelicans last season. The four-time NBA All-Star, who suffered a season-ending torn Achilles tendon on Jan. 26, told The Undefeated that he had no significant offers on the table during the first day of free agency on July 1. He called Warriors general manager Bob Myers on July 2 to tell him he would be willing to sign for the midlevel exception. Durant said he was shocked when Myers called to make him aware of the possibility of Cousins coming. The Warriors have five 2018 NBA All-Stars in Cousins, Durant, Stephen Curry, Draymond Green and Klay Thompson. Because of Cousins’ recovery, it is uncertain when he will play for the Warriors next season, and it could take time for him to jell with the team. Durant said adding Cousins gives the Warriors a “different team” in a positive way offensively. “It gives us somebody that can score in the low post, that can demand a double-team and you can’t switch on him,” Durant said. “That gives us a different look. I feel like a lot of teams felt like they could switch their smalls onto our bigs, but you can’t do that with DeMarcus. So how do the Warriors make it work offensively with Cousins? “Throw him the ball when he’s got a mismatch, throw me the ball when I’ve got a mismatch. If Klay’s open for a 3, pass it. Steph in the pick-and-roll, do your thing. Draymond play defense. … We’ll figure it out,” Durant said. Durant re-signed with the Warriors for a two-year deal paying $61.5 million, with the second year a player option. The $5 million in savings from Durant’s deal offsets the $5.3 million midlevel tax that Golden State elected to use to sign Cousins. The nine-time All-Star averaged 26.4 points last season and earned his second consecutive NBA Finals MVP award. This wild NBA offseason included the Spurs trading disgruntled 2014 Finals MVP Leonard and guard Danny Green to the Raptors for DeRozan, center Jakob Poeltl and a first-round draft pick. DeRozan publicly expressed his displeasure to ESPN’s Chris Haynes about the Raptors trading him without a verbal heads-up. Durant was not surprised by the trade. Durant arrived to Las Vegas on Wednesday afternoon via an Alaska Airlines plane with two AAU boys’ basketball teams and two AAU girls’ basketball teams from the San Francisco Bay Area and Los Angeles. Durant, an Alaska Airlines spokesman, surprised the L.A. kids by taking a flight with them to Oakland International Airport, where he surprised the Bay Area kids during the layover. A Durant decal with his arms outstretched was on the side of the Boeing 737-900ER jet. The four AAU teams sported Durant’s new signature KD 11 shoe and his Nike gear while they were headed to Las Vegas to play in the Bigfoot Hoops Las Vegas Classic. Durant also played in the tournament during his youth. Durant will be taking part in USA Basketball’s minicamp on Thursday and Friday in Las Vegas, although Warriors teammates Curry and Green are not expected to attend. Durant hoped the experience would “spark something and inspire” the teenage basketball players. His advice was to play the game for the love of it and if you are dedicated, focused and honest with yourself, the accolades will come. “It’s surreal with everything that is going on. It’s something I can’t even script. To have all this stuff here that impacts so many up-and-coming basketball players is inspiring to me. It’s pretty cool that I get to do this. I never would take it for granted,” Durant said.